The term is also used to refer to adepts, liberated souls, or professionals. The word, used in a technical sense, was popularised in theosophical literature in the late 19th century when Madame Helena P. Blavatsky, one of the founders of the Theosophical Society, claimed that her teachers were adepts or Mahatmas who reside in Tibet. According to the Theosophical teachings, the Mahatmas are not disembodied beings, but highly evolved people involved in overseeing the spiritual growth of individuals and the development of civilisations. Mme. Blavatsky was the first person in modern times to claim contact with the Theosophical Adepts, especially the Masters Koot Hoomi and Morya. In September and October 1880, Mme. Blavatsky visited A. P. Sinnett at Simla in northern India. The serious interest of Sinnett in the Theosophical teachings of Mme. Blavatsky and the work of the Theosophical Society prompted Mme. Blavatsky to establish a contact by correspondence between Sinnett and the two Adepts who were sponsoring the Society, K.H. and M.
From this correspondence Sinnett wrote The Occult World (1881) and Esoteric Buddhism (1883), both of which had an enormous influence in generating public interest in theosophy. The replies and explanations given by the Mahatmas to the questions by Sinnett are embodied in their letters from 1880 to 1885, published in London in 1923 as The Mahatma Letters to A. P. Sinnett. The Mahatmas also corresponded with a number of other persons during the early years of the Theosophical Society. Many of these letters have been published in two volumes titled Letters from the Masters of the Wisdom, Series 1 and Series 2. There has been a great deal of controversy concerning the existence of these particular Adepts. Mme. Blavatsky's critics have doubted the existence of her Masters. See, for example, W.E. Coleman's "exposes." More than twenty five individuals testified to having seen and been in contact with these Mahatmas during H. P. Blavatsky's lifetime. In recent years, K. Paul Johnson has promoted an interesting but controversial theory about the Masters. After H.P.B. 's death in 1891, numerous individuals have claimed to be in contact with her Adept Teachers and have stated that they were new "messengers" of the Masters conveying various esoteric teachings. Later, many New Age groups used to call them Ascended Masters although their character and teachings are very different from those explained by the Theosophical movement. Ascended Masters, in various descendants and offshoots of Theosophy, are held to be a group of spiritually-enlightened beings, who in past incarnations were ordinary humans, but who have undergone a process of spiritual transformation. The term "Ascended Master" was first introduced to the public in 1934 with the publication of Unveiled Mysteries by Guy Ballard in The "I AM" Activity. This term was further popularized by The Bridge to Freedom (1951), The Summit Lighthouse (1958), The Temple of The Presence (1995), and various other organizations. Originally presented by H. P. Blavatsky in the 1870s, the "Masters of Wisdom", "Mahatmas" or "Elder Brothers" were further developed by C. W. Leadbeater, Alice Bailey, Helena Roerich, Manly P. Hall, and many others in Theosophy based organizations, especially in the United States. They believe that Ascended Masters are individuals who were formerly embodied on the Earth and learned the lessons of life during their incarnations. They gained mastery over the limitations of the matter planes, balanced at least 51% of negative karma, and fulfilled their Dharma (Divine Plan). An Ascended Master, in such an understanding, has become God-like and a source of unconditional Love to all life, and through the Ascension has united with his or her own God Self, the "I AM" Presence. It is further claimed by various groups and teachers that the Ascended Masters serve as the teachers of mankind from the realms of Spirit, and that all people will eventually attain their Ascension and move forward in spiritual evolution beyond this planet. According to these teachings, they remain attentive to the spiritual needs of humanity, and act to inspire and motivate its spiritual growth. In many traditions and organizations, they are considered part of the Spiritual Hierarchy for Earth, and members of the Great Brotherhood of Light, also known as the Great White Lodge or Great White Brotherhood. Esotericism is defined as the belief that secret societies and Mystery Schools possess advanced spiritual knowledge. Such beliefs are extremely ancient. This idea was re-introduced in the West by the Rosicrucians in the seventeenth century. The founder of the Theosophical Society, H. P. Blavatsky, in the late nineteenth century brought attention to the idea of secret initiatory knowledge, by claiming her ideas were based on traditions transmitted to her by occult means from a group of highly evolved humans which she called the Mahatmas or Masters. These Mahatmas, she claimed, were physical beings living in the Himalayas, usually understood as Tibet. ".. they are living men, born as we are born, and doomed to die like every mortal. We call them “masters” because they are our teachers; and because from them we have derived all the Theosophical truths... They are men of great learning, whom we call Initiates, and still greater holiness of life." While some of her critics believe the Masters are pure fantasy, other writers suggest that her changing stories were meant to hide the identities of real human teachers guiding her work. In assessing the veracity of Blavatsky's claim regarding the existence of these Masters, it is worth noting that at least twenty-five other people left a written account of having met the Mahatmas themselves during Blavatsky's lifetime. Blavatsky claimed that she personally met numerous Masters on countless occasions, and was also the guest of the Master Koot Hoomi while visiting the "Little Tibet" region of Kashmir. After Madame Blavatsky's death in 1891, the Mahatma concept was developed by her successors in the Theosophical Society leadership, Annie Besant and Charles W. Leadbeater, who described the Masters in great detail and added Jesus to their number. In Leadbeater's book, The Masters and the Path (1925), the Masters are presented as ageless and superphysical, albeit still limited by human bodies. Other branches of theosophy developed the theory slightly differently, notably Alice Bailey from whose book Initiation, Human and Solar (1922), Leadbeater may have borrowed some of his details. There is considerable difference between the concept of Masters in nineteenth century Theosophy (as described by Blavatsky, Olcott, Sinnett, and others) and the current concept of Ascended Masters. The believers in "Immortal Saints and Sages" claim that these individuals have gone through the Initiations of the Transfiguration, Resurrection, and the Ascension to become "Ascended Masters". 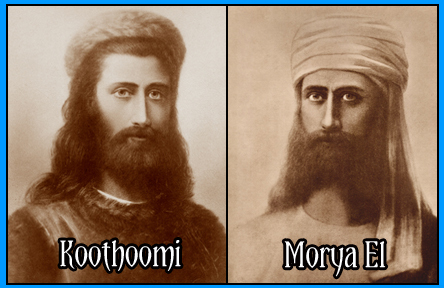 The twentieth century teachings of the Ballards, Prophets, and others claim that although Morya and Koot Hoomi (Kuthumi) were Adepts and Masters of the lower matter planes and the elemental forces of nature, they had not become Ascended Masters until 1898, while Serapis and the Maha Chohan, who were interacting with Theosophists during Blavatsky's time, already were Ascended Masters. An unascended Master has, according to these later teachings, overcome the limitations of the lower matter octaves (physical, emotional, mental), yet has chosen to postpone the final Initiation of the Ascension to remain in time and space to externalize and focus the Consciousness of God for the evolutions of the Earth. If a person takes a Bodhisattva vow, that one may choose to remain with the humanity of this Earth as an unascended Master in one of the lower Spirit/Matter Octaves, as was the case with Babaji. It is believed by proponents of these beliefs that if enough mastery and externalization of the Divine Nature has been developed, such an Adept becomes an Initiate of one of the Brotherhoods or Sisterhoods of Light under the auspices of the Great White Brotherhood. It is claimed that there can be a high degree of attainment within the lower body vehicles of expression (physical, emotional, mental, memory), yet that Adept may still not be Ascended (not primarily expressing through the Higher Bodies). One such teaching claims that examples of unascended Masters are: Yogananda, Mataji, and Lao-tzu. The belief is that they have un-Ascended bodies that are not flesh and blood of the lowest of the sub-plane substance of the physical octave, but of the "finer matter" that composes the upper etheric sub-planes of the physical octave, as well as the emotional (astral) octave, and the mental octave. In some versions of the Theosophical belief systems, the Masters are collectively called the "Great White Brotherhood". The use of the term "white" refers to their advanced spirituality (i.e., that they have a white colored aura) and has nothing to do with race. The early versions of Blavatsky's writings described the Masters as ethnically Tibetan or Indian (Hindu), not European. Belief in the Brotherhood and the Masters is an essential part of the syncretistic teachings of various organizations that have continued and expanded the Theosophical philosophical concepts. Examples of those believed to be Ascended Masters are Jesus, Confucius, Gautama Buddha, Mary the Mother of Jesus, Pope John Paul II, Kwan Yin the compassionate Bodhisattva, as well as alchemist Comte de Saint-Germain, Vaivasvata Manu and Kuthumi, (one of Helena Blavatsky's "Mahatmas"). It is believed that all of these put aside any differences they might have had in their Earthly careers, and unite instead to advance the spiritual well-being of humanity.